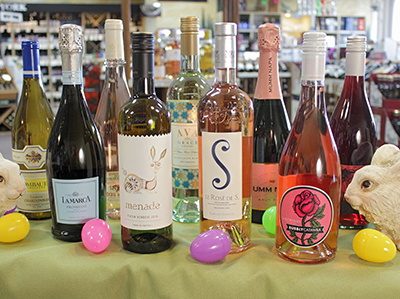 Wines for Passover & Easter! Ithaca Coffee Company’s Tavern at Triphammer Wine List! "We will not be undersold. We will match all competitors current advertised pricing!" Aromas of black plum, cherry, rhubarb and hints of earth and loam. Flavors of red plum, raspberry and blood orange are underpinned by distinctive river stone minerality and savory umami character. Plush and richly textured with juicy, yet balanced acidity and integrated toasty barrel spice. 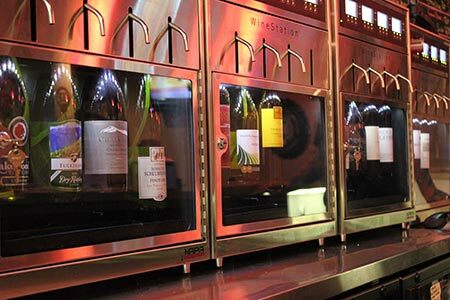 Click on the image above to see what unique and high end wines are offered at Ithaca Coffee Company's Tavern at Triphammer, all at their peak freshness and taste thanks to newly installed WineStation preservation and pouring systems. All wines poured by the glass in the Tavern are also available for purchase as a full bottle next door at Triphammer Wines and Spirits. Easter weekend has always seemed like the kickoff point for reintroducing spring ingredients to the dinner table. For wine, that translates to a similar mood shift. But that doesn’t mean that full-bodied reds have to be set aside; it simply means to look for ones that have an inherent sense of freshness. 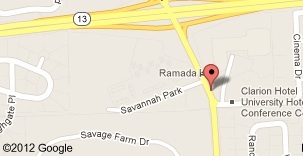 Lamb: Lamb is strong in flavor and supports tannic, full-bodied red wines. Whether it is a mild spring day or a little bit chilly, Cabernet Sauvignon is a great option. Ham: Glazed ham is synonymous with sweet-and-sour flavors, and would work well with a red wine with low tannins and high acid, such as Pinot Noir. Or try a dry rosé. It figures: If white wine goes with white meat and red wine goes with red meat, why wouldn’t pink wine go with pink meat? Roasted Veggies: Pair with a clean, crisp, white wine such as Verdicchio, Albariño or Grüner Veltliner. Potatoes: With a potato salad, you should pour a dry rosé wine. But if you find a savory potato side dish enhanced by meat, pop open a soft red like Malbec. Chocolate Bunnies: Rich, creamy chocolate needs a rich wine to walk alongside it. A Zinfandel will give you those deep fruit flavors that will complement the creaminess of the chocolate bunny. For many American Jews, Manischewitz wine is as much a part of Passover as the four questions and matzoh ball soup. 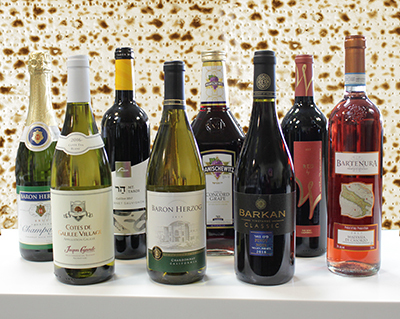 With wine presenting such an integral part of the Passover holiday, the vast majority of Kosher wines are made Kosher for Passover, so you can find the perfect wine to suit your tastes and your Seder. Matzah Ball Soup: An off-dry white such as Chardonnay or Pinot Grigio will help balance out the salty broth and are also nice pairings for Matzah. Charoset: A sweet wine such as Moscato, sweet Rosé or Manischewitz will make the Charoset as sweet as the optimism it is meant to represent. Gefilte Fish: A fruit-forward wine such as a Riesling or Sauvignon Blanc would work well. If you are going with a sweeter wine, add a little horseradish to balance the sweet. Brisket: A nice Cabernet Sauvignon or Syrah blend will pair well with the brisket. The rub is the key to making this a good match, but the meat can also be wine-braised with whichever wine you are drinking. Dessert: Toasted coconut macarons pair nicely with Chardonnay or any sweet wine. A flourless chocolate cake goes well with any red wine. Regardless of how carb-drained it is, Passover is still a celebration, and a celebration calls for Champagne. Sparkling wine is a great way to start or end the evening meal. L’chaim! Made from Grenache Blanc, Roussanne, Clairette and Marsanne, this wine has a soft nose of white peach and lemon zest. On the palate there are flavors of white peach, fennel bulb, apricot and rye. The finish is marked by a slight touch of menthol followed by a burst of tangerine flavor. Fresh notes of rhubarb, tri-tip tartare and grilled sourdough, young violets, red vines, smoked paprika and juicy pomegranate seeds. A hearty 80% Pinot Noir dominates in this sparkler, rounded out with 20% Chardonnay. With a pink-salmon hue, it offers peach and wild strawberry aromas followed by similar, medium-bodied flavors, with the addition of succulent plum. and a touch of violets. Damiani Wine Cellars celebrates the unique micro-climate and dramatic landscape that is New York’s Finger Lakes. 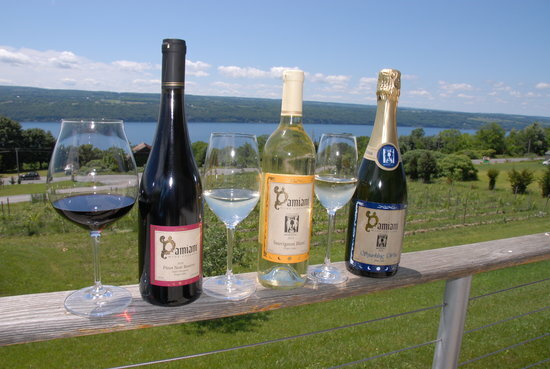 They cultivate several vineyards nestled along the eastern shores of Seneca Lake where they purposefully limit the amount of fruit per vine to achieve concentrated flavors, and work with other premier growers in the area to source the finest grapes each vintage. The results are award-winning wines that yield extraordinary complexity and finesse, wines showing distinct character and expression of the land. A blend of Cabernet Sauvignon, Merlot, and Cabernet Franc. Make no mistake about it; this mini-Meritage blend is not fooling around. The depth of the wine is apparent even at first sniff. On the nose, the fruit is very pronounced, offering up dark fruit aromas and a hint of anise and autumn leaves. The palate is full and rounded with tannins that are very well integrated. The balance between the mouth-feel and the weight play perfectly with the wine's plum, cedar and clove flavor profile. An extremely food friendly wine, pair this blend with duck confit or a hearty ratatouille. 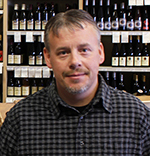 You are receiving this email because you provided your email address to Triphammer Wines & Spirits.